strategies, and assessment approaches, as well as the integration of distance learning and service-learning into accelerated learning programs. To aid in examining broader questions of impact and outcome, several chapters discuss research from a variety of contexts, with both descriptive and comparative findings. This volume also provides a critical perspective and future consideration of strategies and roles for accelerated learning as a positive force in higher education. It will aid both practitioners and researchers by providing informative ideas and practices from leaders and educators who have administered, taught, and studied this innovative learning format. This is the 97th volume of New Directions for Adult and Continuing Education, a quarterly report published by Jossey-Bass. 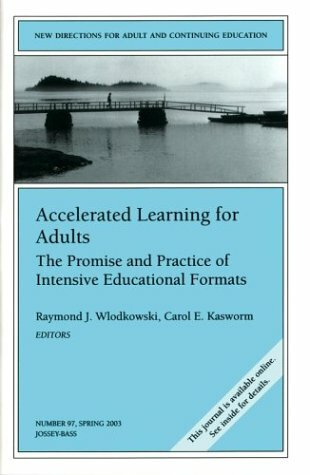 Raymond J. Wlodkowski is professor emeritus at Regis University, Denver, and the founding executive director of the commission for Accelerated Programs. A licensed psychologist and author of numerous books, he lives in Seattle and conducts seminars for colleges and organizations throughout North America.